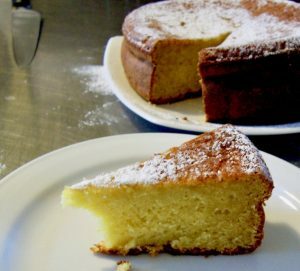 Apple and Olive Oil Cake | Patrice Newell's online organic biodynamic Australian garlic and olive oil. In a bowl beat 3 egg yolks with half the sugar until mixture is pale. In a separate bowl whisk the 3 egg whites and the remaining sugar until they form soft peaks. Back to the egg yolks bowl, sift in flour and baking powder. Add 60mls (cooled) poaching liquid and 60mls of extra virgin olive oil. Slowly fold in whisked egg whites (1/3 at a time) until all is combined. Pour combined mixture over the apples that have already been placed in buttered dish. Bake in 180C oven for 20-25 minutes. It rises a little like a souffle and falls back again. Serve directly from baking dish.